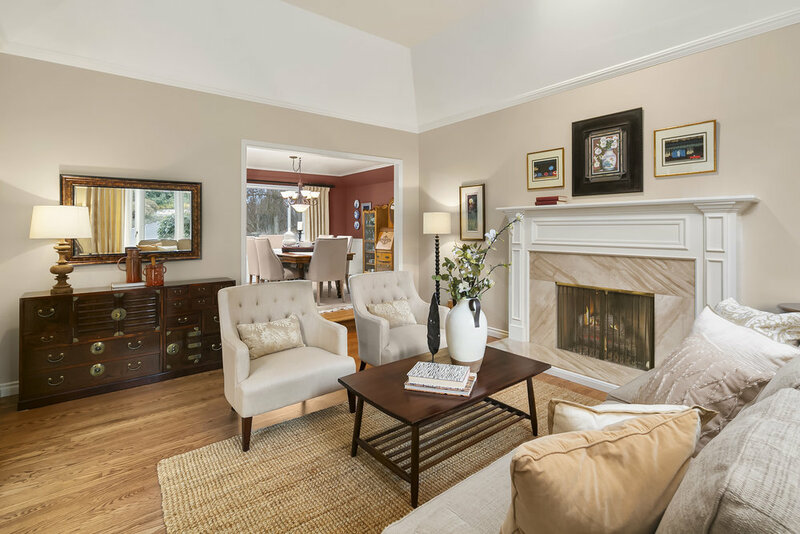 A large and refined home, 1026 Lancaster Way is optimized for casual enjoyment, with numerous rooms devoted to recreation and relaxation, complimented by elegantly detailed formal spaces. It offers three full levels of space, connected by a pair of open staircases at either end of the house, allowing great circular flow for active families and entertainment, alike. A warmly neutral palette of colors and materials that includes hardwood floors, maple cabinetry and natural stone surfaces ensures years of timeless enjoyment as a backdrop to a wide range of collections and tastes. A curved drive approaches the home and is shielded from the street by mature native landscaping. It presents a timelessly classic façade, clad in a brick water table with board and batten cedar siding. Large windows capture plenty of natural light and frame relaxing views of the surrounding neighborhood and woods, while a three car garage to the left of the entry helps create an enclosing sense of intimacy and welcome with its arched doorways and brick details. The house is entered through an enclosed front porch with a pair of leaded glass doors that open into a dramatic two-story FOYER, which is brilliantly illuminated by a matching feature window. Generous coat closets and a display wall occupy the area to the immediate left of the entry, while an open central stair gracefully leads to the second and lower levels. 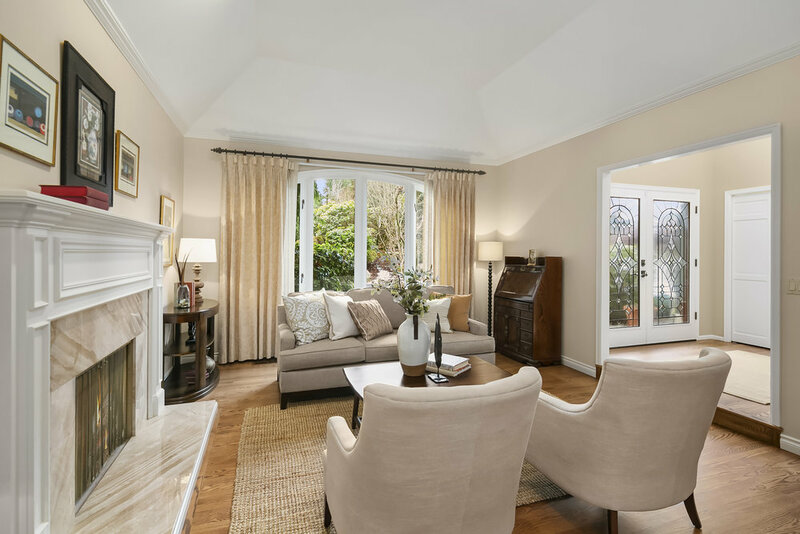 To the right, sits an elegant sunken LIVING ROOM with high, coffered ceilings and outlooks over the front yard through an arched casement window. This room is anchored by a substantial wood-burning fireplace with gas starter that is set into a custom mantel with marble surround. The living room steps up into the formal DINING ROOM, which is made more intimate and cozy by a lower coffered ceiling that reflects that of the living room. A large window frames views over the backyard with its sport court, landscaped patio and the nature beyond, while a charming picture window provides outlooks over the front and side yards. To the left of the entry, is a spacious POWDER ROOM with a large granite-topped vanity and leaded cut glass window. An office and a deep laundry room round out the more utilitarian wing of the first floor, and complete a circular floor plan with access through to the kitchen and den. The home OFFICE is a large and private space with great built-in storage, ample closet space and a corner desk with outlooks over the entry and front yard through an arched casement window. The LAUNDRY area offers direct access to the garage with fold-down drying racks, a dedicated sink and folding area, as well as lots of cabinet storage for supplies and off-loading groceries. It is finished with durable ceramic floor tiles that compliment the oak hardwoods running throughout the rest of the main floor. The rear of the house is dedicated to open family living, with a spacious gourmet kitchen, casual dining area, a den with its own fireplace and a large media room. The KITCHEN is a cook’s dream with light maple shaker style cabinets, slab granite counters and subway tile backsplashes. 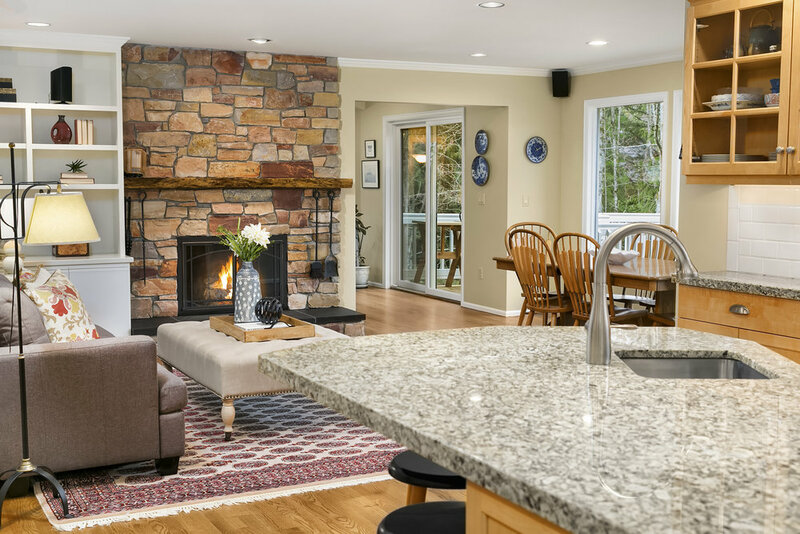 A large cooking and dining island anchors the area, providing plenty of space for prep and casual gatherings with a 36” gas downdraft cooktop as its centerpiece. Double Dacor wall ovens and a built-in microwave complete the cooking center, while cooling is provided by a matched pair of full-sized, stainless steel Whirlpool refrigerator and freezer units. A new stainless Kitchenaid dishwasher helps with clean up, and is built into an extra deep washing area that is naturally lit by a huge bow window that overlooks the backyard. A WALK-IN PANTRY and a desk for home management complete this high-performance center of the home. To the left of the kitchen, a sunlit BREAKFAST AREA provides a casual retreat for family dining and gatherings, while a large den offers built-in bookcases, a wood-burning fireplace and space for relaxation. These rooms lead into an additional FAMILY ROOM in the back corner of the house with room for large viewing parties. 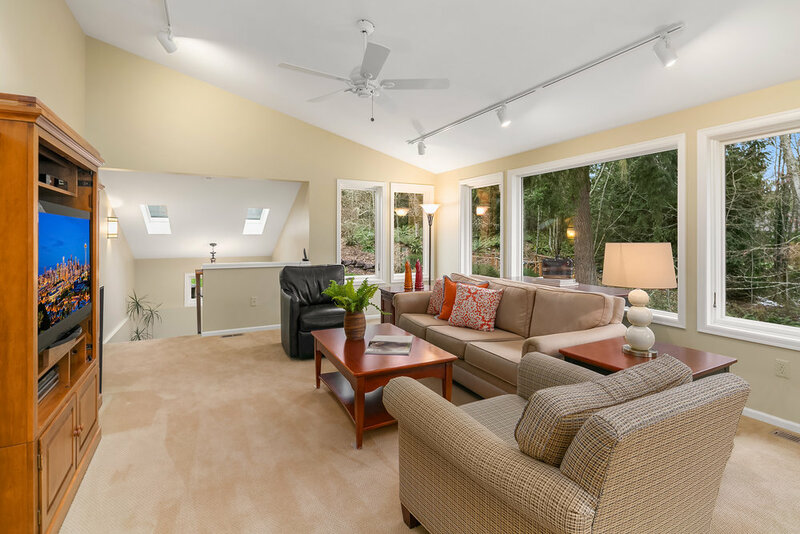 This multi-purpose space includes three walls of windows, sliding door access to a huge deck, direct garage access, a second staircase to the lower level and vaulted ceilings for a great sense of volume and light. An elegant oak spindle staircase leads from the foyer to the upper level of the house, landing in a hallway that acts as a bridge between the master and family/guest wings of the second floor. It includes a wide and deep linen closet, access to a full bath and room for occasional seating, with natural light provided by a large skylight. This wide passage leads into a spacious MASTER SUITE to the right, with coffered ceilings and windows on two walls that overlook the side and back yards. It is a very private and quiet space, separated from the rest of the house and offering a seating area and a large ensuite bath. The opulently appointed bathroom is divided into multiple zones that include a mirrored wall for the two-sink vanity and makeup area, a deep bump out that encloses a step up soaking tub with hand shower and two windows, and a separate room for the water closet and walk-in shower. 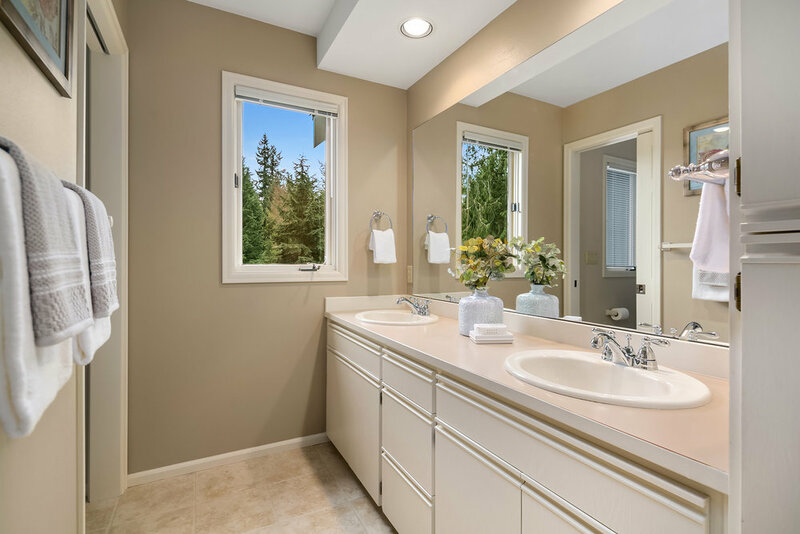 The bathroom flows back into a dressing room with an array of custom organized built-ins. Two ADDITIONAL BEDROOMS occupy the other end of the upstairs hallway, sharing a full bath with a two-sink vanity, plenty of linen storage and a separate area bathing and the water closet. The bedrooms mirror each other, with wide closets and room for study areas and seating space. 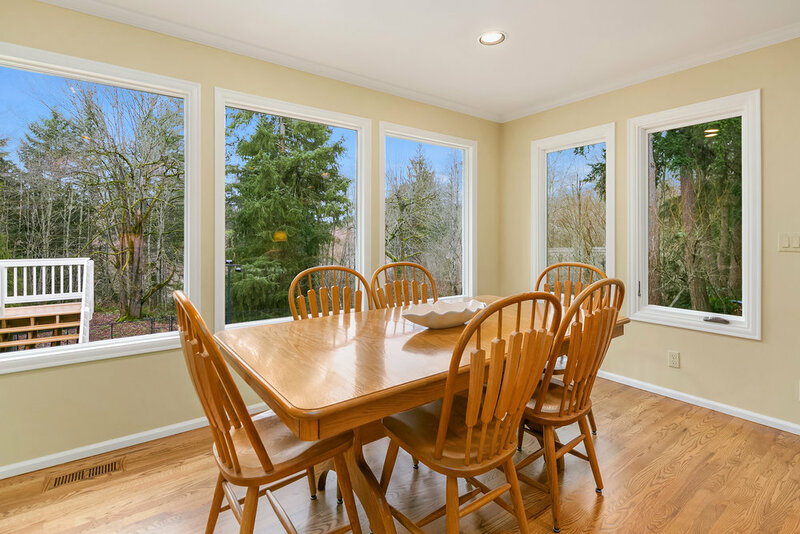 Each one looks over part of the yard and welcomes plenty of daylight through large windows. The lower level of the house is divided into spacious public and private areas that all share great natural daylight, easy access to the backyard and high ceilings with ample recessed lighting. It comprises a secluded guest bedroom, a full bath, an additional home office, a study nook and two huge dedicated recreation and relaxation areas. 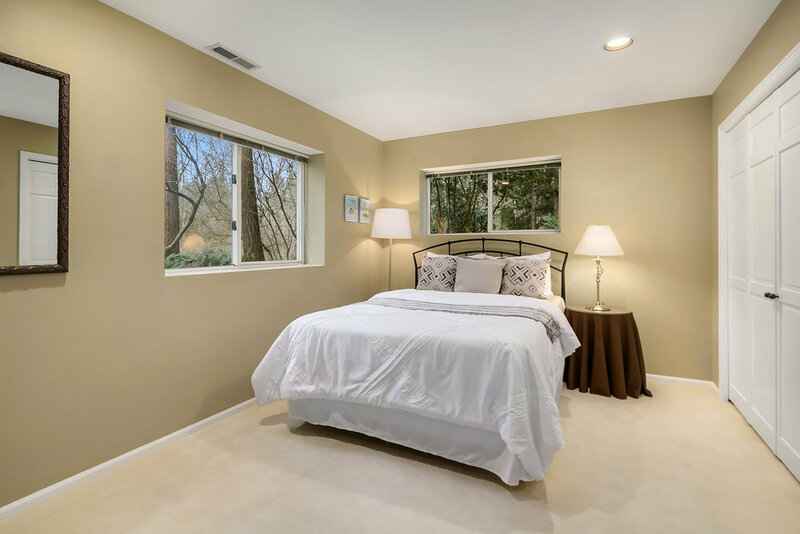 The GUEST ROOM resides in the back-right corner of the house and is flooded with natural light and territorial views from two walls of windows. It offers plenty of closet space and the convenience of a full bath next door. A second home office looks directly over the patio, with a deep study nook located across the hall. The private area opens up into the first of two grand downstairs casual areas, with sliding door access to the patio. This room is slightly smaller in scale, making it an ideal playroom, TV retreat or home library, while the second area is optimized for use as a game venue. Currently set up for table tennis, it is perfect for a pool table or virtually any other indoor recreational activity with its recessed lighting and expansive width and depth. 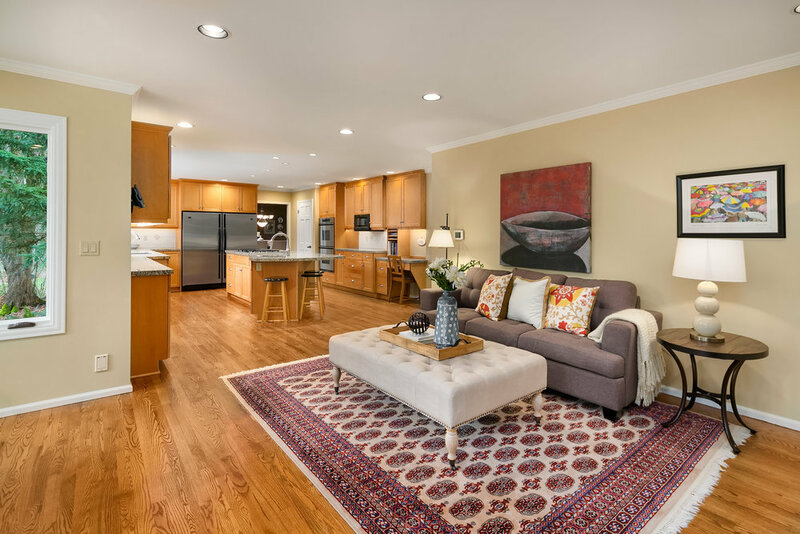 With so much multi-use space, this house is ideal for highly active or multi-generational families, those with returning children or the need for live-in services. This is truly a home that is built for those who seek a luxurious environment that can still sustain the young at heart. The house is beautifully sited on a gently sloping lot with a combination of mature and recent native landscaping that eases its transition into the surrounding forest, while defining a series of outdoor spaces for dining, relaxation and recreation. 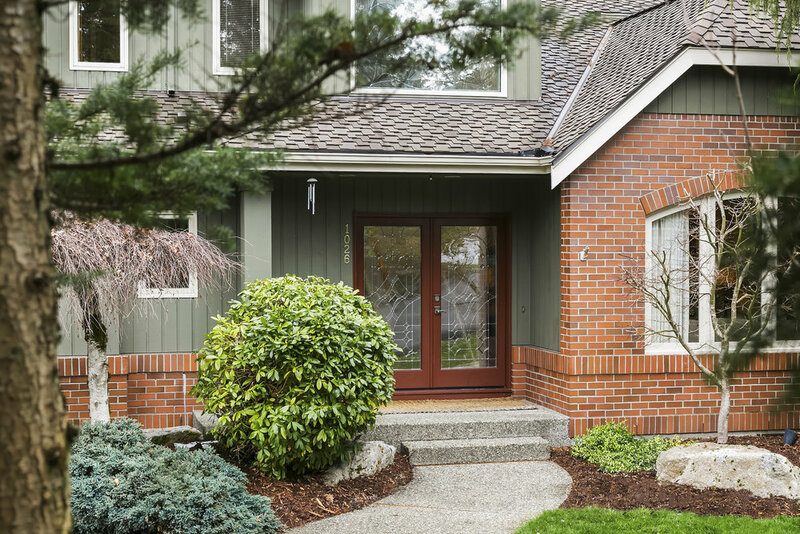 A sprinkler system takes care of the lawn, while a large storage shed is perfect for gardening tools. 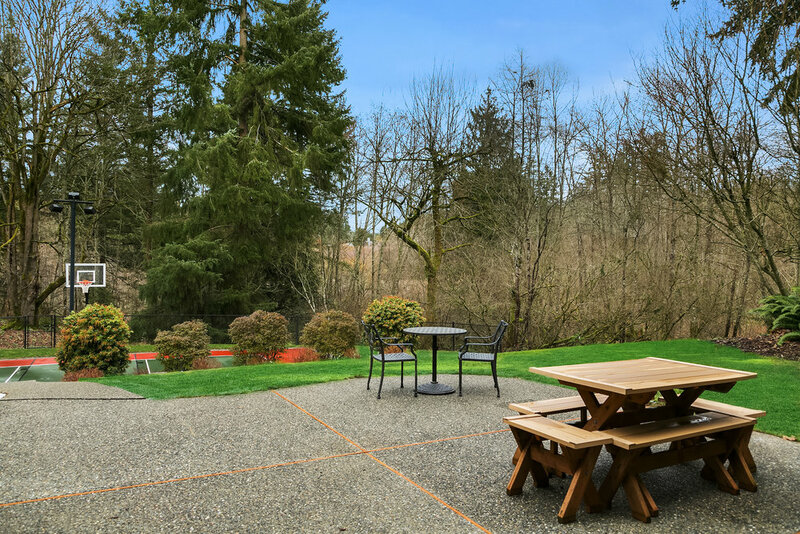 In addition, there is a vegetable garden that is fenced off for protection from the wildlife that is regularly spotted in the neighborhood, as well as a carefully positioned sport court that is set up for basketball and pickleball, with dedicated storage and LED lighting. The property backs up to protected wetland that is owned by the community, preventing any future development, while affording a tremendous sense of enclosure and privacy to its residents. 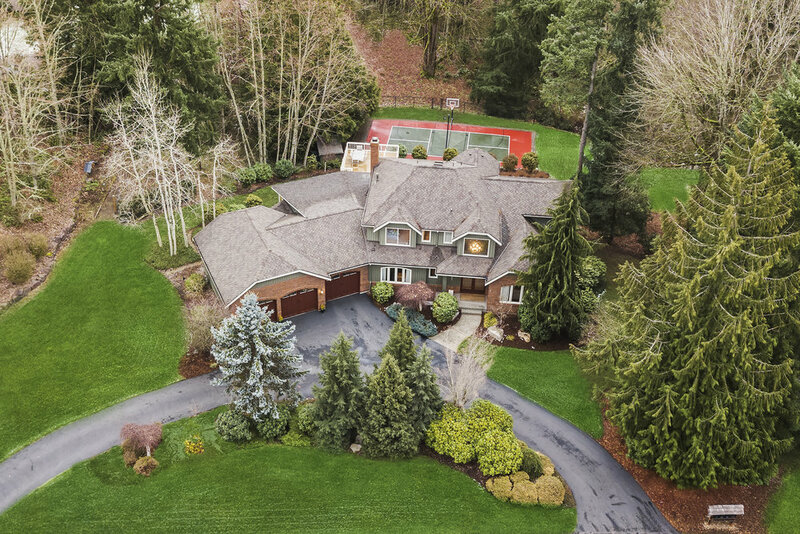 Located in the heart of the Sammamish Plateau, this property is very conveniently located to the urban centers of Bellevue, Redmond, Issaquah and Seattle, and enjoys excellent proximity to the entire Eastside tech corridor, as well as access to award-winning Issaquah schools. As such, it represents the perfect combination of quiet country life with the business, cultural and entertainment options of a major metropolitan area. Built to a very high standard and continuously updated to reflect contemporary design and living trends, this residence is ready to provide a luxurious and activity-rich environment for many years to come.